For fans of sweet, sincere, emotionally evocative fantasy, it was hard to imagine a better match-up than fantasy great Diana Wynne Jones and Japanese filmmaking great Hayao Miyazaki. 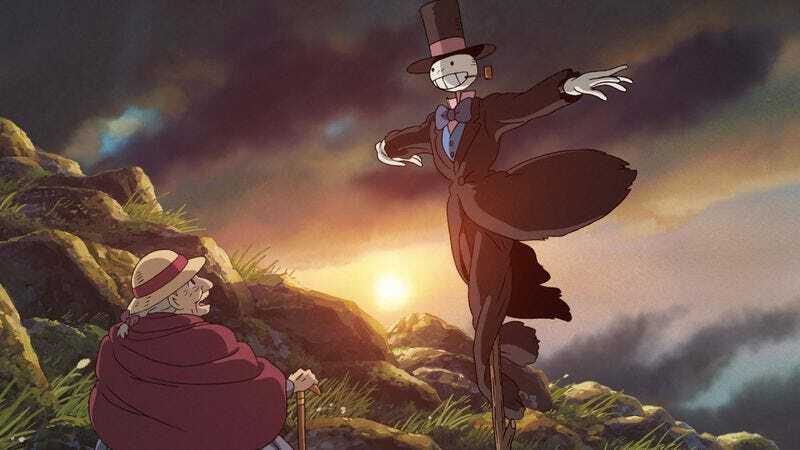 The two came together like chocolate in peanut butter for 2004’s Howl’s Moving Castle, Miyazaki’s beautifully animated adaptation of Jones’ book of the same name. As part of the Gene Siskel Film Center’s “Castles In The Sky” film retrospective, dedicated to the work of Miyazaki, Isao Takahata, and their contemporaries at Japan’s famed Studio Ghibli, The A.V. Club’s Tasha Robinson will be introducing the film at a screening in Chicago this Thursday night, July 26th, at 7:30 p.m., then sticking around to lead a Q&A about the film and Studio Ghibli afterward. Howl’s Moving Castle was the film Miyazaki came out of retirement to make, after the unprecedented worldwide success of his previous feature, Spirited Away. As is typical for Jones’ fantasy novels, Howl’s features a crowded cast of oddball characters: a handsome young wizard who dissolves into green goo when he’s upset, a plucky young heroine changed into a creaking old lady by a malevolent witch, a young apprentice forced to pretend to be an old man in order to cover for his irresponsible mentor, and a fire demon who lives in a hearth and provides the motive power for the titular rattletrap walking castle. Miyazaki’s version streamlines the story and takes it in a radically different direction, but maintains the elements of Jones’s work—one big discussion topic at the Thursday screening will certainly be how Miyazaki brings his own specific career-long concerns and obsessions into the story, swapping them in while radically departing from Jones’ story. The Ghibli retrospective began in June and continues through August, with screenings of Ponyo and Porco Rosso coming up; follow the link above for the full schedule, including screenings featuring Q&As with other Chicago-based film critics. This is a rare opportunity to see Studio Ghibli’s work as it was meant to be seen, on the big screen, where its rich detail becomes fully apparent; come hang out with other Miyazaki fans and see everything that isn’t clear on a home video system, including what Tasha looks like when geeking out about two creators she dearly loves. Tickets are available through the Film Center site through Thursday morning, or at the box office on the day of the screening.